As a stay at home mom and nap-time writer (who doesn’t usually get a nap-time to write anymore) you could say I’m a busy gal. There are always dishes to fold and clothes to unload, kids to shuttle from here to there, a husband to tend to, church activities and Bible studies to do and attend, loved ones to care for, friends to love… *wipes the sweat from her brow*… it’s a lot to handle for one girl. I’m positive you can relate! With everything tugging at us from all sides how is a modern mom like me supposed to get everything done without forsaking my relationship with God, my daily quiet time? He is the only way I can get through my day, so how can I fit it all in? I know that I need to build my day around Him and not the other way around. I also know that we all make time for the things we want to do. BUT sometimes the things we feel we have to do start to push everything else off the calendar square. Our priorities start to get skewed. When doing anything, our heart attitude is what matters most to God, because it is our heart attitude that drives our actions. (Out of the overflow of the heart the mouth speaks.) Lets pretend for a moment that we’re planting a garden. Our heart attitude is the seeds that are planted, our actions are the outward appearance of those seeds, and the end results of our actions are the plants that come from the seeds. If I plant a heart attitude, or seed, of “I have to” do this, rather than a seed from the “I want to” do this attitude, then the plants that spring up from those seeds will be completely different. Although the outward appearance of the seeds, or the actions themselves, were the same, the end results are drastically different. From the “I have to” attitude we generally glean very little from our time with God. Usually because we are much less open to receiving a word of insight or comfort or instruction from Him; we are simply going through the motions of religion. However, from the “I want to” attitude we glean much more from our time simply because we are more open to receiving and it has meaning to us from the very beginning. I feel like I need to add another attitude phrase. The “I have GOT to” do this attitude. Honestly, that’s the attitude I have walked into my quiet spot with today. I spent a good deal of time last night snuggled in bed working on writing a morning prayer for myself based completely on scripture. I ended up with about 10 scriptures, all very long, and the more I read the more of them I wrote down, until I realized “Lord, if I could, I think I would simply pray the WHOLE Bible over myself every morning! They’re ALL good!” And at that point it was 11pm, my husband was climbing into bed with me and I decided I would work on it tomorrow. Famous last words right!?! An “I have GOT to” attitude… you know… those moments when I have GOT to pray or I’ll explode from being pulled in a million different directions at once. The attitude that comes around when you realize, hey, I didn’t have my “preventative” time with God earlier so I’d better do it NOW before things get worse. So, in light of how the last 5 hours of my life has been, I have concluded that A) my life is a run-on sentence, and B) my morning prayer can still be based on scripture without being the whole scripture! And it was at that moment, like a breath of fresh air sweeping through the room, that God pulled the string to the light bulb over my head and BOOM! 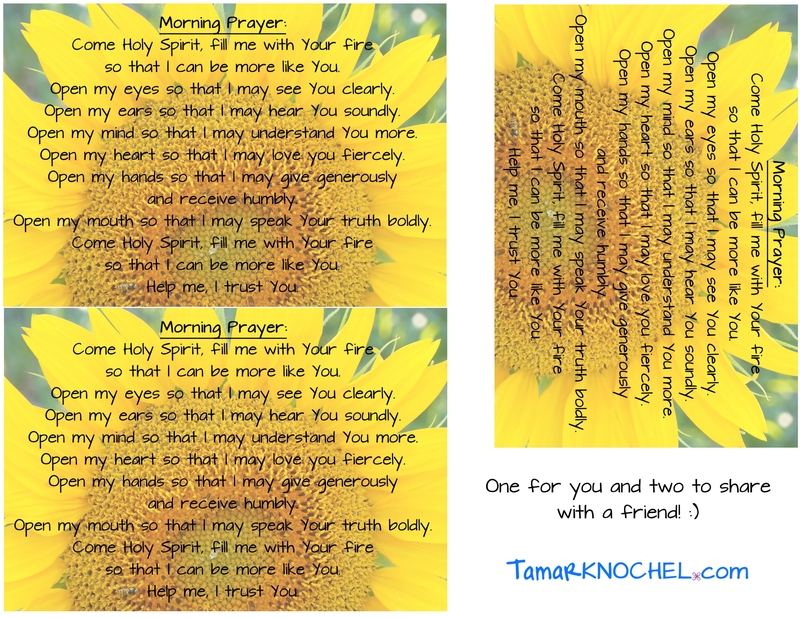 There was my scripture-based Busy Mom’s Morning Prayer!